Playing basketball under the system of the French Basketball Federation (Fédération Française de Basketball) has already been explained in the women’s players playing basketball pyramid. This section goes one step further and explains in more details the competition structure for the different leagues and the various cup competitions that the teams participate in. 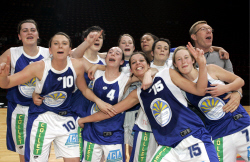 The 2007-2008 is the third season with 14 teams that play in the Ligue Féminine de BasketBall. (The history of the previous format can be found by clicking on this link.) All the teams play each other on two occasions during the regular season. 1. Only the top four teams at the end of the regular season will play off for the French Championship. The team that finishes first at the end of the regular season will automatically qualify for next season’s FIBA Europe EuroLeague Women. 2. The teams that finish between 5th - 12th will play off for a spot in the Fiba Europe EuroCup Women. 3. The teams that finish in the last two spots will automatically be relegated to NF1. 4. The first four teams at the end of the regular season will also play in the Federation Cup, but the competition will not count towards any European qualification. 5. No LFB side is allowed to play their second team in one division lower (NF1). All the clubs in the LFB and the teams from NF1 also participate in the Basketball French Cup. This is a straight knock-out competition played over several rounds with the final match being played at Paris Bercy. 1. The team that is first at the end of the regular season will automatically be promoted to the LFB. The only exception to this ruling is if the CFBB* finish in first place. In the case of CFBB finishing first then the automatic promotion place is given to the second placed team. 2. The play-off series between the top four teams will be organised by the team that will finish first at the end of the regular season in the format of a final 4. The winner of this final 4 will be crowned as NF1 Champions and win the second promotion spot to the LFB. If the winner of the final 4 is the team that already won the regular season title or the CFBB then the second promotion place is given to the next best placed team in the final 4 competition. The bottom four clubs will automatically be relegated to NF2. The teams from this division will also play in the French Cup. If a team from NF1 happens to win the French Cup and do not win promotion to LFB, they will not be allowed to participate in FIBA Europe competition. The second team from LFB is not allowed to participate in this division. *The CFBB (Centre Fédéral de Basket-Ball) is a team of young women playing basketball based at INSEP (Institut National du Sport et de l'Education Physique) in Paris. The players join the CFBB at 15 and stay for three years. In the first year they play in NF2 and for the players retained to continue their basketball education they play basketball in NF1 in the following two years. As this is a national development group their teams in NF1 and NF2 can neither be promoted nor relegated. There is no change of format in this year’s competition for women playing basketball that is to say there will be four groups of 14 teams with all the teams playing each other twice on the basis of home and away. At the end of the regular season the winners from each group will take part in a final 4 to determine the NF2 Champions of the season. The winners of each group have the right to gain promotion to NF1 with the exception of the CFBB team and the second teams of the LFB: Last season Valenciennes’s (USVO) second team won their group and finished as runners-up in the final 4 but they were not allowed to go up into the upper division, NF1. Also if a club has already one team in NF2 and their lower division team won a promotion place then the club cannot have two teams in one division. This is the hardest division for women playing basketball in France because each group consists of only 12 teams. At the end of the season the first two teams in each group qualify for promotion to NF2 while the bottom four teams are relegated so for the majority of the time all the teams are actively involved in one of the battles at either end of the table. 96 teams are split into eight groups. Just like in NF2 the groups are as far as possible made up of teams in the same region in order to reduce travelling costs. The eight group winners are then split into two groups and play off over a weekend to determine which two teams qualify for the NF3 final 4. The winners of the weekend tournament are joined by the winners of NF3 tournaments in Reunion and the French Caribbean to determine the NF3 champions of the season. Teams that qualify for promotion may not be allowed to be promoted if the club already has a team playing basketball in NF2. At the same time clubs can refuse to accept promotion. This is normal as some clubs cannot afford the extra costs involved in travelling in the higher division. In France age groups are based on year of birth as of the 1st January, therefore the cadettes category for 2007-2008 involves girls playing basketball born in the years 1990, 1991 and 1992. 32 teams play in division A and are split into four groups of eight teams. The Federation has tried to make the groups as regional as possible but it is not uncommon for a team to travel 700 km one way for a match. The first phase of the competition is all the teams in each group play each other twice. At the end of the first phase the top four teams in each group retain their division A status for next season and qualify for the second phase of the competition. The 16 teams are then split into four groups of four with the winner of each group qualifying for the final 4. The winner of the final 4 is crowned as French Champions. For this season one team declared forfeit after only two games leaving only 31 teams this season. The 16 teams that missed out from division A are automatically relegated to division B for the second phase. This season five groups made up of eight teams are playing basketball in division B. During the first phase of the competition all the teams in one group play each other twice. Like in division A, one team has already pulled out. At the end of the first phase the teams relegated from division A join the division B teams for the second phase. The teams will be split into 14 groups of four teams, but with two teams dropping out this may result in two groups of three teams. The prize for winning the group is automatic promotion and the right to be playing basketball in division A for the following season. The 14 group winners and the two best second placed teams are then split into four groups of four teams and play off over a weekend for the right to qualify for the play-offs for the Tropheé du Président (President’s Cup). Playing basketball at national level starts at this age group, for the 2007-2008 season 1993/1994 age group. 72 teams in France are split into 12 groups for the first phase. The groups for the first phase are regional and only the top three teams from each group qualify to play in the elite group for the second phase while the bottom three teams play in the second tier national competition. The format for the elite and second tier national competition is the same. The teams are split into six groups of six teams with the winner from each group qualifying for the quarter-final. In addition the best two second placed teams qualify for the quarter-final. The change this year is that a quarter-final round will be played over two legs (home and away) with the winners qualifying directly for the final 4. The winners of the elite competition are crowned as French Champions while the winner of the second tier wins the President’s Cup. The format for the competition is the same for the amateur clubs and the U18 cadettes. It is a straight knock-out competition for women playing basketball over one match. Due to the different levels of teams in senior competitions teams from lower divisions are given a certain number of points head start. This rule does not apply to the Cadettes Cup. The last eight teams are split into two groups of four and the quarter-final and semi-final are played over a weekend with the winner from both groups qualifying for the final which is normally played in Paris Bercy. There is no national cup for U15 minimes.